In 1972, one idea changed the way the world plays games forever. 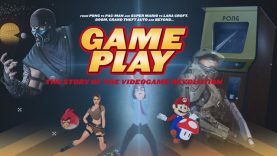 “Gameplay” is a feature documentary film on the history of videogames. Almost 5 years in the making, the film spans the time from the technologies origins to the birth of the arcade game. From “Pong” to “Pac Man”, “Super Mario” to “Lara Croft”, “Doom”, “Grand Theft Auto” and beyond, we chronicle the remarkable story of the fastest evolving new media of all time. The film features never seen before interviews with such videogame pioneers as Nolan Bushnell, David Crane, Noah Falstein, John Romero, Todd Howard and many more, plus all of the iconic and groundbreaking games of the past 40 years tied together with original animation and graphics.